That’s a wrap, and for one local city it was a lucrative brush with Hollywood. film, starring Kevin James, is expected to premiere next summer. cameo appearances in the film. situation,” Superintendent Richard DeCristofaro said. support vehicles during the filming, which ran from February through June. were tapped for some scenes and were paid a total of $2,000. to the band,” DeCristofaro said. A casting call was also held, landing some locals spots as extras. and the city had vacant school space. economically. It had to have been a boost to local business in some ways. 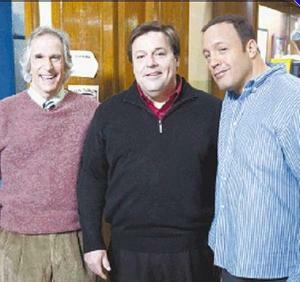 Quincy Mayor Thomas Koch, center, and actor Kevin James.